This Saturday (May 9th) sees the action resume in the Tier 2 UKRDA National South division of British Champs. The more astute amongst you might have noticed that we haven’t actually posted our report on the previous game day in Southend yet. Er, we’re saving it up to post as a double report alongside our write-up of this weekend’s awesomes in Bristol, yeah? (We will put it up soon, promise.) Suffice to say Royal Windsor continued their inexorable haulage of points to cement their place at the top of the division, whilst Brighton went down to regular tournament nemesis Bristol by the tiniest of margins. Saturday’s action takes place on the University of the West of England campus close to Bristol’s Parkway station in the far North of the City. Doors open at 1.30pm, with the hosts taking on Portsmouth Roller Wenches at 2.30 followed by Brighton v Royal Windsor Roller Girls. Tickets are available online until midnight today (Friday) priced £8 adults and £4 kids. They should be available on the door too. It’s probably too late to offer public transport tips now. Suffice to say Bristol is in a Westerly direction and if you bought train tickets early enough you could do it for about £12 each way. There are at least three ways to get there by train from Sussex; into London and out from Paddington, via the Gatwick-Reading corridor, or along the coast changing somewhere in Hampshire. Hi. You currently lie mid-table in the National South with one win and one loss. Has your Champs campaign gone the way you were expecting? We felt strong against LRR and knew we had a good chance against Brighton. We made it hard on ourselves and our supporters in the crowd by reducing a 20 point lead to four points in the last jam, but are delighted to have a win on the board. We came into this group ranked the lowest of the six teams after a poor run of results through 2014, so one of our aims was to prove we were stronger than our ranking suggested and that we deserved to be in this tier. We think we have achieved this. You’re taking on Portsmouth Roller Wenches, who are currently without a win. Have you met them before? What do you know of them? You know that poor run of results in 2014 I was just talking about? The Portsmouth game came smack in the middle of this, and remains a low point in my personal derby career. We were in a massive transitional period. We had some great new players, but hadn’t quite worked out their roles in the team, and I gave what is perhaps the worst half time speech in history. Needless to say, Portsmouth won! The actual game is a bit of a blur, but we are aware that they have some big names and great players that we have come across on the mixed scrim/bootcamp circuit, and we are looking forward to pitting our strongest selves against them. Any particular Bristol players or tactics people should keep an eye out for? Would you care to predict the result? I’d like to give some love to our bench team of Shi No Kamo and Haley Flammable. If you’re interested in tactics in roller derby, then keep an eye on them and how they control the run of the game with their decision making and responsiveness. The importance of an astute and consistent bench team is very underrated in roller derby, but our ability to turn a game around (or more recently to not completely squander a lead!) is in a large part down to this pairing. And no, I wouldn’t care to predict the result! The day’s other game sees Brighton take on table toppers Royal Windsor. How do you expect that one to go? This will be a fascinating match up and we’re all looking forward to relaxing and enjoying our birthday whilst watching. Windsor dominated over Seaside in Southend in the most convincing of fashions, and we are very familiar with Brighton’s strengths. It’s hard to ignore a performance like Windsor’s versus Seaside, but for our prospects in the future of this tier we’re hoping for a Brighton win! You’re hosting Saturday’s event, which we understand is also your fifth birthday bash. What can you tell us about the venue? Anything special planned for the day? The venue is the University of the West of England’s Centre for Sport. It’s a return to an old venue for us, having played most of our open games recently across the dual carriageway at the Wise campus. UWE lacks a few of the benefits of Wise (for example no tiered seating), but we have some creative chair layout plans to make up for this, and the venue has the benefits of a larger car park and a hall big enough to fit the merch stalls (which are relegated to the foyer at Wise). The hall itself is unlicensed, but an attached shop sells booze – you’ll just have to drink it on the grass outside. As for special plans, if you thought we were loud with thirty people in London, then wait to see the level of noise we can generate on our home turf. What can we expect from the after party? Is Stokes Croft really as full of hipsters as people think? Absolutely. Feared by franchises and chain stores and adored by hipsters, Stokes Croft is Bristol values in a nutshell. Just down the road from the after party you can put your head around the door at the Art for Africa Auction (https://www.facebook.com/events/1556780017924664/) and witness some of Bristol’s graffiti writers and artists in action. Banksy will be there. Probably. The Rockers currently sit in mid table in National South with a win and a (very narrow) loss? Has your Champs campaign gone the way you expected so far? We’ve had a lot of player movement this season, with some usual suspects taking breaks and some new faces popping up, so it’s been a bit of an experimental year so far. As such we’ve not really had any expectations re our performance in the tournament. One highlight was definitely the last few minutes of the Bristol game – two final jams, a handful of power line ups and a mega close score! You’re taking on the divisional leaders Royal Windsor on Saturday? Any particular RWRG players or tactics you’ll be looking out for? We played Windsor when we first started as a closed door game. We were very green and it was a fantastic game. A lot has changed since then. Windsor are an experienced, well trained and cohesive team. They played in the States recently and that shows them to be an ambitious and successful league. We have been studying their players and have our eyes on a few, but really it is their teamwork that people will notice. Any particular Brighton players people should keep an eye out for on Saturday? We’ve got a few newer faces on the roster this time, so I’d definitely say it’s worth looking out for them. They’ve all worked really hard and have been doing a lot of training outside of regular practice, so I’m sure they’ll impress! 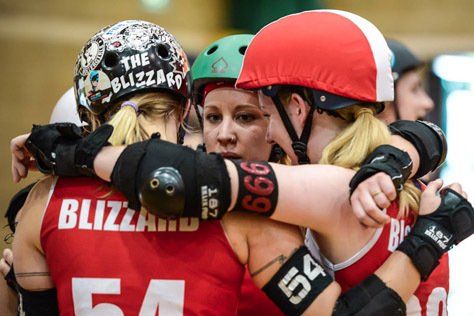 The day’s other game sees hosts Bristol take on Portsmouth Roller Wenches. How do you expect that one to go? I think that’ll be a great game to watch. Both teams have some really solid blockers and really agile jammers. Whatever happens both teams are real fighters, so will be giving everything they’ve got right up until the last whistle. Finally, what are your hopes for the rest of the 2015 Champs campaign? Obviously we want to score all the points and do all the winning. Isn’t that what all teams want?! We’re also looking at working with our new team dynamic over the next few games and really cementing our teamwork. Windsor currently top the divisional table, having scored a whopping 760 points in two games. Things going the way you expected? We didn’t expect that! But we’re really pleased with how it’s gone so far. 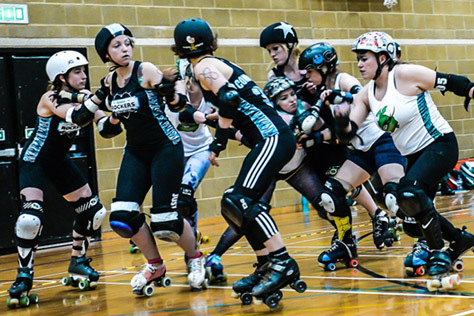 What do you know of Saturday’s opponents, the Brighton Rockers? Brighton played our B-team once. We know that they’re awesome. We will be watching out for Bash! Any particular Windsor players or tactics people should keep an eye out for? Our main tactic is teamwork so we hope that all of our players will be a threat. Our goal is to take the victory, but we know that Brighton could end our winning run. Any thoughts on the Bristol v Portsmouth game? Both are really strong teams and it’s anyone’s game. Blizzard is deadly and RIP McMurphy is a double threat. Finally, what are your hopes for the rest of your Champs campaign? We hope to keep winning but we’ve got tough games to come. We never count our chickens! This entry was tagged Brighton Rockers, Bristol, Bristol Roller Derby, British Champs, Portsmouth Roller Wenches, roller derby, roller skating, Royal Windsor Roller Girls, sport, UKRDA, women's sport.